Radical nephroureterectomy with formal bladder cuff excision was first described in 1933 for the treatment of papillomatous tumors of the renal pelvis and ureter, and has since become the standard of care for upper urinary tract neoplasm. While less invasive therapies for upper tract transitional cell carcinoma have emerged for appropriately selected patients, radical nephroureterectomy remains the standard of care because of a propensity for tumor multifocality, progression, high ipsilateral recurrence rates, and low incidence of contralateral disease. Since 1991, laparoscopic radical nephroureterectomy has been incorporated into the treatment armamentarium for upper urinary tract neoplasm because of its reduced morbidity with equivalent oncologic outcomes when compared to open surgery. More recently, robot-assisted radical nephroureterectomy (RARNU) has been described as an alternative to laparoscopic nephroureterectomy. RARNU offers the potential advantages of improved surgeon efficiency in suturing, ergonomics, and ease of bladder reconstruction after bladder cuff excision. 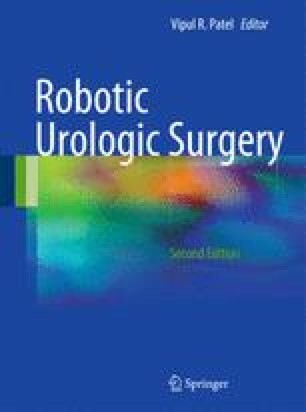 In this chapter we describe the technique of a two-docking robot-assisted laparoscopic nephroureterectomy.